�About Us: We work in all aspects of House Re-Painting and Re-Plastering. We offer a precise Hassle-Free Paint Job with great prices. We are always Punctually On Time, Professional & Respectful in all the homes that we work in and offer all our customers the Highest Standards, Service and Professional Courtesy. "We understand that we are working in your home and work within your busy schedule to insure that your family will not be inconvenienced by the Paint Work being done in the least". How we Work: As a rule, we work one room at a time, moving your household belongings, carefully and covering everything with New Plastic Sheeting, Clean Canvas Drop Cloths and Masking Tape. We make all the needed repairs to walls & ceilings prior to painting, i.e. ; Fixing Cracks, Holes, Water Damage, or Mold . We even go as far as temporarily removing Outlet Covers and wrapping Light Fixtures in plastic so that paint will not get on them. In this,� meticulous way of working, we offer our clients, the Highest Quality Painting Results and Cleanliness. Water Damage: Water Damage Areas are 100% repaired and fixed completely, as if they were never there. Mold : If your home has Mold Issues, we are equipped to handle�them using the Best Anti - Mold Paint Available on the Market. Boaz showed up in the morning with all of his supplies, and I asked him, "Ok, what do I need to do to set up?" He said, "Nothing. Go do your work." A few hours later, I came out of my office, and the job has been done perfectly. Thanks Boaz! Boaz is a treasure! The paint job is excellent. Our water-damaged grubby walls have metamorphosed into smooth clean bright surfaces. The furniture and floors were covered neatly beforehand. Great attention is paid to small details. Most of all Boaz is such a pleasant person: smiling, calm, soft-spoken. We cannot recommend him highly enough. Boaz did an amazing paint job in our apartment. It was old and runned down with peeling paint and some mold. Boaz knew exactly what to do to make our apartment look great! And he put everything back in its place, it was very clean. We are so thankful for the unbelievable work he did. We couldn't believe what our place looked like when he was done, TOTALY transformed! Boaz did an incredible job and we highly recommend him. He is super nice, and his prices are great! All of the laudatory reviews are fully deserved. we just had our entire apartment repainted and are delighted with the results: The painting has rejuvenated our old Jerusalem apartment, which was in really bad shape. It is now a delight to live here. Boaz is the best of the best. A true mensch and a consummate professional. I would put him in the top 1% of home service people that I have ever worked with in the U.S. and Israel. Do this: sit down. Take out a piece of paper. 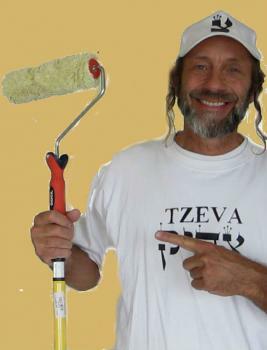 Write down on every single thing you want your painter to be: beautiful quality, really cares about doing a good job, great price, does anything extra you asked for, sterling personality, kind, faithful...keep going...you'll have to write even more to get to a description of someone as good as Boaz Ginzberg is. The man is amazing. Everything you hear is true. We needed a super job for some very discriminating people done in a 100-year-old apartment. Boaz came in with a super price, and we sat back in amazement at the super job he gave us. This extra thing he did, that extra thing. He refinished things I didn't even ask him to do! And always with a smile, and listening to what you want, and answering right away. Came on time, worked world class neatly, and left the place gorgeous. If you live in New York and you need a painter, fly over Boaz, it'll be worth it to you! Like everyone else who has recommended Boaz, I found him to be a super painter! He really did leave everything in tip top shape and did a beautiful job with the painting and scraping walls etc. Easy to communicate with--a true professional. Boaz was efficient, honest, prepared and punctual. He went above and beyond what was called for. He made sure that everything was clean and bright. He went the extra mile to make sure that everything looked not just great but amazing! I mean wow, I didn't recognize the apartment. It looked better than when I moved in. Thank You. I can highly recommend Boaz of Tzevz Tzadik. He did a superb job,arrived on time, kept to the schedule and price quote, and left the house clean at the end of the day. A wonderful painter and a good person! What can we say- the Tzeva Tzadik amazed us. He told us he would do a great job and that we were in good hands. People have said that in the past and haven't lived up to my expectations. The Tzeva Tzadik, on the other hand, went above and beyond. He gave us a price while our apartment was still furnished, but when we moved out we realized the wall conditions were worse than we thought. When the Tzeva Tzadik saw the bare walls, he didn't even flinch and kept the original (very decent) price. The job took as long as he had said in our first conversation and the results were phenomenal! The walls were beautiful, the floors were spotless and he even cleaned off all our light switches and plugs! We will definitely call him next time we need a paint job. It was a pleasure working with him and am looking forward to seeing him again. I don't have enough stars for Tzeva Tzadik. He painted our new apt, and the old one we moved out of. Both places he went way above and beyond. He didn't charge extras - he GAVE us extras! Cleaned the outlets, fixed little things not in the estimate, and and and. An example - we put in new windows, and one of them had a huge wood swath showing after the install. I figured he would attempt to patch it - nope. He put in molding for us, and didn't say a word. Honest, responsible, on-time and careful. He is not the cheapest, but he is NOT expensive and you get so much more than you pay for! We love him!!! where it had been before, when he was done Painting. call Tzeva Tzadik (Yisroal Boaz) first. I called a list of painters and was most impressed with him and his ability to discuss the wok, the process and the price. in all that he did. Polite, courteous and prompt. I can't imagine that anyother painter could be better. So clean and precise in all his fixing and painting. our Home. On time (so we could leave and go to work)as usual . Prepared and covered the entire room. Put drop cloths down and then painted the rooms exactly as we dreamed they could be. Perfect ! And then had everything put back and spotlessly clean by the time we returned to make dinner for the kids. This guy is the best. We are so happy ! 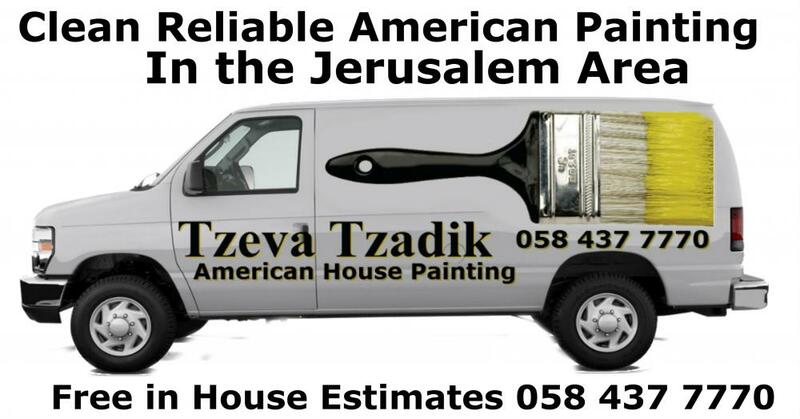 Yisroal (Tzeva Tzadik ) gave us at great price quote and then gave us a great paint job. Yisroal Boaz "the Tzeva Tzadik" is a total Yekke. Clean and organized. Perfect in his painting and so polite to his customers. It was a total pleasure to have him in our home working. Prepped room with plastic, etc. Fix all cracks and holes. and put the room back together. Nicest Guy and the best worker I've ever seen, really. So neat, so organized, so clean. It was like magic- he didn't disturb our family one bit. So courteous. This is the painter for you. Paint Tzadik is right ! Great Name, Great guy, even greater painter. Everything was perfect, price, work, EVERYTHING. Do your self a favor and go with the Paint Tzadik..
We loved that he was always on time. He was so clean and tidy. delivered were perfect as well. What a perfect job in everyway. And the price was perfect also..
Clean, polite, organized, honest and a great painter;what more can you ask for. We are so happy with our new paint job and can't begin to tell anyone and everyone that Tzeva Tzadik is the the BEST !!!!!!!!! Go with the Tzeva Tzadik ! He gave us a great price quote, followed by a top of the line paint job. Do yourself a favor and go with this guy ! Nicest guy.. and a Great Painter.. The Nicest guy..And a Great Painter.. He made getting the house painted so easy. Arrived on time everyday, arranged the room before starting, took electric covers and light switches covers off so they wouldn't get paint on them, fixed walls, painted and cleaned. Then put room back together perfectly... Didn't start more work then he could finish by 5 pm.. and then came next day and did it again- what a "Mensch"
Honest,clean,dependable and a great painter. Not only one of the nicest people I've met in Israel, but the best painter as well. He transformed our moldy bathroom ( it was so moldy it was unusable) into something you see in a magazine. Toda Raba - Tzeva Tzadik !! Besides great prices (I know I checked around) Tzeva Tzadik's work skills are amazing. He Spackled out a few walls that were water damaged down to the cement. He Spackled those areas out like brand NEW ! We had him paint for us 4 years ago. The paint still looks as fresh and new as the day he painted it. All the fixes that he made in the wall, with Spackle, held up as well ( and I think we had an earthquake or 2 since then). Anyway if the day ever comes that we need to re-paint ( and the way it looks now, that day may never come- lol). We would use him again in a heart-beat and can't recommend him highly enough to the entire Janglo community. "Do yourself a favor and go with the Tzeva Tzadik"